“We ask ourselves today: what is the meaning of this extraordinary event, the meaning of this canonization? It is the celebration of holiness. And what is holiness? It is human perfection, human love raised up to its highest level in Christ, in God. At the time of John Neumann, America represented new values and new hopes. Bishop Neumann saw these in their relationship to the ultimate, supreme possession to which humanity is destined. With Saint Paul he could testify that “all are yours, and you are Christ’s, and Christ is God’s” (1 Cor. 3, 22). And with Augustine he knew that our hearts are restless, until they rest in the Lord. His love for people was authentic brotherly love. It was real charity: missionary and pastoral charity. It meant that he gave himself to others. Like Jesus the Good Shepherd, he lay down his life for the sheep, for Christ’s flock: to provide for their needs, to lead them to salvation. And today, with the Evangelist, we solemnly proclaim: “There is no greater love than this: to lay down one’s life for one’s friends” (Io. 15, 13). John Neumann’s pastoral zeal was manifested in many ways. Through faithful and persevering service, he brought to completion the generosity of his initial act of missionary dedication. He helped children to satisfy their need for truth, their need for Christian doctrine, for the teaching of Jesus in their lives. He did this both by catechetical instruction and by promoting, with relentless energy, the Catholic school system in the United States. And we still remember the words of our late Apostolic Delegate in Washington, the beloved Cardinal Amleto Cicognani: “You Americans”, he said, “possess two great treasures: the Catholic school and the Confraternity of Christian Doctrine. Guard them like the apple of your eye” (Cfr. Epistola 2 iunii 1963). And who can fail to admire all the loving concern that John Neumann showed for God’s people, through his priestly ministry and his pastoral visitations as a Bishop? He deeply loved the Sacramental of Reconciliation: and like a worthy son of Saint Alphonsus he transmitted the pardon and the healing power of the Redeemer into the lives of innumerable sons and daughters of the Church. He was close to the sick; he was at home with the poor; he was a friend to sinners. And today he is the honor of all immigrants -- and from the viewpoint of the Beatitudes, the symbol of Christian success. The Eucharistic Sacrifice was the center of his life, and constituted for him what the Second Vatican Council would later call “the source and summit of all evangelization.” With great effectiveness, through the Forty Hours Devotion he helped his parishes become communities of faith and service. But to accomplish his task, love was necessary. And love meant giving; love meant effort; love meant sacrifice. And in his sacrifice, Bishop Neumann’s service was complete. He led his people along the paths of holiness. He was indeed an effective witness, in his generation, to God’s love for his Church and the world. There are many who have lived and are still living the divine command of generous love. For love still means giving oneself for others, because Love has come down to humanity; and from humanity love goes back to its divine source! How many men and women make this plan of God the program of their lives! Our praise goes to the clergy, religious and Catholic laity of America who, in following the Gospel, live according to this plan of sacrifice and service. Saint John Neumann is a true example for all of us in this regard. It is not enough to acquire the good things of the earth, for these can even be dangerous, if they stop or impede our love from rising to its source and reaching its goal. Let us always remember that the greatest and the first commandment is this: “You shall love the Lord your God” (Matth. 22, 36). True humanism in Christianity. True Christianity -- we repeat -- is the sacrifice of self for others, because of Christ, because of God. It is shown by signs; it is manifested in deeds. Christianity is sensitive to the suffering and oppression and sorrow of others, to poverty, to all human needs, the first of which is truth. Our ceremony today is indeed the celebration of holiness. At the same time, it is a prophetic anticipation -- for the Church, for the United States, for the world -- of a renewal in love: love for God, love for neighbor. And in this vital charity, beloved sons and daughters, let us go forward together, to build up a real civilization of love. Or, as the most recent successor of America's lone bishop-saint summed it up on this feast, "John Neumann was a missionary first. Everything else was second. You and I are called to exactly the same vocation. Let’s begin that work today." Normally, today's feast would be a happy moment in the city Neumann left behind. This year, however, a cloud of anxiety and sadness hangs over the place. 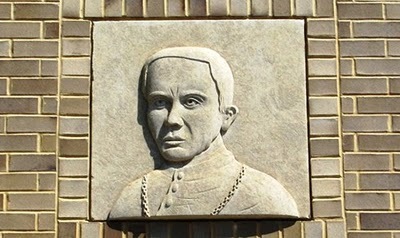 A hundred fifty years ago this spring, Philadelphia's fourth bishop arrived from Baltimore to begin a tenure that would be short in years, but whose legacy endures into the present, above all in the system of Catholic education whose groundwork he laid. It's something of a bitter irony, then, that on the morning after Neumann's feast, the schools whose building he began will pause early in the day for a moment of silence. Thirteen months in the making, at that moment -- 10am tomorrow -- the Blue Ribbon Commission tasked with crafting a more secure and sustainable model for Catholic education in Philadelphia will present its recommendations at a private meeting of pastors and principals. The group's report is to be made public at a 4pm news conference. For a local church where the Third Plenary Council's mandate of parish-based education was, itself, an article of faith, becoming the backbone of what would evolve into a network of "institutions of religion, education, and charity" unparalleled anywhere in the Catholic world, there is no overestimating how hard the news is going to hit. Hit it must, though, if Neumann's mission is going to have its best chance of survival in a very different age. Indeed, tomorrow's going to be a very rough one 'round here. As no shortage of things remain in the air for now, more once a clearer picture begins to emerge.